Home » 1-2 Kings » The Floating Axe Head in 2 Kings 6: Miracle or Fable? The Floating Axe Head in 2 Kings 6: Miracle or Fable? The Bible reports that one of the miracles God performed through the prophet Elisha was that an axe head that had been lost in a river floated on the water (2 Kings 6:1-7). Some miracles in the Bible seem easier to ridicule than others; this is one that critics especially like to ridicule. So what should we say about this story? Should we read it as an historical account of an actual miracle, or as a fable or tall tale that is not meant to be taken literally? Let’s first acknowledge a couple of things. First, we cannot prove that the axe head floated. On the other hand, the critics cannot prove that it did not. Since there is only one account of the event, and since there is no way to mount an evidential argument for or against the occurrence of this particular miracle, the most one can say is either that it is credible (if you believe in a God who can perform miracles) or that it is not (if you don’t). Second, whether this particular miracle happened is not, in and of itself, of monumental in the grand scheme of things. We are not saved by the floating axe head; the event does not function as a pivotal act of God in history. If it turned out that in its context the axe head story was a fable, that finding would not in any fashion undermine the historical truth of the resurrection of Jesus Christ. It might, of course, undermine the belief in the complete historicity of the major Old Testament narratives that run from Genesis through Chronicles, and it would challenge the way some Christians (including this author) understand those biblical narratives. But we have nothing to fear from an honest examination of the question. Since we cannot prove or disprove this specific event, or even marshal historical evidence for or against it, the best we can do is to consider its plausibility or credibility within the context of the biblical worldview as a whole. This means asking the following questions. (1) In its literary context, is this story presented as historical or as a parable or metaphor or some other kind of non-historical story? If the story is part of an historical narrative, then its historicity is at least a possibility; if the story is clearly not part of an historical narrative, then we have no reason to think this particular story is about an actual historical event. (2) If the God of the Bible exists, is this particular miracle story possible? (3) If it is possible, does the event fit a pattern of miracles or divine acts found elsewhere in the Bible, or is it an oddity that seems quite out of place in the Bible? Depending on how these three questions are answered, we will draw some conclusion as to the credibility of the story as an actual miracle that took place in real history. 2 Kings 6—Myth or History? In this context, the passage about the floating axe head would appear to be presented as an historical event, one of the many miracles performed through Elijah and Elisha, not as a fable or as part of a myth. Believers in the God of Christianity (or for that matter the God of Judaism), if they question the floating axe story, have a responsibility to give an explanation of the entire Elijah–­­Elisha narrative, not just the floating axe story. While progressive Christians and others who take a less than conservative view of the Bible may feel safe in expressing some incredulity over a floating axe head, they may be less disposed to dispute that Elijah and Elisha really were prophets through whom God performed miracles. In any case, the narrative clearly claims to be historical, so it should be given at least a fair hearing in this regard. Could God Make an Axe Head Float? It should be obvious that the God of the Bible, if he exists, could make an axe head float on water. After all, the God who created the world would have no problem causing an axe head to float. The God who made water and iron can manipulate them in any way he chooses and could easily intervene in his creation to cause an iron axe head to surface in a river. I understand why atheists don’t believe such things are possible, but Christians should at least admit that God can do such miracles if he chooses. As for the atheists, rejecting God’s existence because they find the axe head story laughable is not a sound argument. In other words, if atheists have reasons to doubt the existence of God, they will not find the story of the floating axe head credible, but it would make no sense to argue in reverse from their skepticism about the floating axe head to the general conclusion that a God who does miracles is not credible. The point here is that if there is a Creator God with the attributes the Bible described God as having, then such a God could surely make an axe head float on a river. Therefore, we conclude that if God exists, this miracle would at least be possible. But possibility is not the same thing as plausibility or credibility. This leads to our final question. To assess the consistency of the miracle of the floating axe head with the general presentation of miracles in the Bible, we will consider it in relation to three contexts: (a) the other miracles attributed to Elijah and Elisha, (b) miracles earlier in the Bible, especially in the foundational stories of Israel, and (c) miracles later in the Bible, specifically in the Gospels. (a) The miracle of the floating axe head is consistent with the other miracles attributed in Kings to the agency of Elijah and Elisha. In the case of Elijah, there is the miracle of the replenishing flour and oil that kept a widow and her son alive, followed by the miracle of the son’s revival when he was dead or near death (1 Kings 17:8-24), the fire on the altar at Mount Carmel (18:20-40), and the rain following a long drought (18:41-45). Elisha threw salt into a spring and it became potable (2 Kings 2:19-22); he had a widow fill with oil as many vessels as she could gather (4:1-7); he prophesied that a childless woman and her elderly husband would have a son, and years later raised that son from the dead (4:8-37); he threw flour into a pot of wild stew and it became safe to eat (4:38-41); he multiplied loaves of barley and ears of grain to feed a hundred men (4:42-44); and he had Naaman the Syrian army commander wash in the Jordan to be healed of his leprosy and later cursed his faithless servant Gehazi with the leprosy (5:1-27). These miracles through Elijah and Elisha give, restore, or sustain life, in some instances by the provision of resources of economic value, most directly the miraculous supply of oil. The restoration of the axe head, the loss of which would have brought a sizable debt to the man who had borrowed it from another man, fits comfortably into this context of Elisha’s ministry. The casting of the stick into the water recalls Elisha casting salt into a spring and flour into a stew, in each case acting as God’s agent to meet an immediate material need. 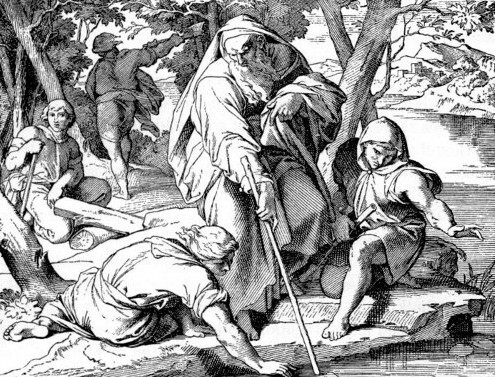 (b) Some of the miracles of Elijah and Elisha recall the miracles that the Lord God performed in the Pentateuch, especially the birth of Isaac to elderly Abraham and Sarah (and Isaac’s “restoration” to them when he was nearly sacrificed on an altar) and the supply of manna in the wilderness during the exodus. The axe head going down into the Jordan River and coming back up, which in the immediate context echoes Naaman going down into the Jordan and coming up free of leprosy, recalls the crossing of the Israelites across the Jordan into the Promised Land under Joshua. (c) The miracle of the floating axe head also reverberates with some of the events reported in the Gospels. In the ministry of John the Baptist—a prophet much like Elijah and Elisha—baptizing people in the Jordan, repentant people literally went down into the river and came back up. The Christian reader of the miracles of Elijah and Elisha also cannot help but be struck by their similarities to many of Jesus’ miracles. Obvious examples of such similar miracles include the feeding of the five thousand (in which bread and fish were miraculously multiplied), the healing of lepers, and the raising of children from death (especially the son of the widow of Nain, Luke 7:11-17). Thus, as we read individual passages such as the account of the floating axe head in the broadest biblical context, we find that such passages are consistent with larger themes, motifs, and patterns of the miraculous in Scripture. The most important miracle of Jesus, of course, is his resurrection from the dead. If we believe that God could raise Jesus from the dead, we certainly should have no problem believing that God could raise an iron axe head from the bottom of a river. And in that comparison we probably have the key to understanding why, from a theological perspective, the story of Elisha and the floating axe head is in the Bible. It is one of the numerous signs throughout the Old Testament that point to Jesus Christ, who brings us eternal life by his death and resurrection. The suggestion that the stick typologically anticipated the wood of the cross while the surfacing of the iron axe head was a type of the resurrection from the dead of the Head of the redeemed is not as much of a reach as one might suppose.2 Whether one goes that far with the typology, the account of the floating axe head is consistent with the broad picture of God’s miracles throughout the Bible, including the most important miracle of the resurrection of Jesus Christ from the dead. Thus, there is no reason for Christians to be embarrassed by the floating axe head. 1. On the historical context of the Old Testament accounts of the prophets, see especially Kenneth A. Kitchen, On the Reliability of the Old Testament (Grand Rapids: Eerdmans, 2003), 30-37, 374-75. 2. The interpretation goes back to the third-century church father Origen of Alexandria. On 2 Kings 6:1-7, see Peter J. Leithart, 1 & 2 Kings, Brazos Theological Commentary on the Bible (Grand Rapids: Brazos Press, 2006), 199-201.